How Much Alcohol Is Safe for Men to Drink? Good news: having a couple of beers with your buddies probably won't hurt your health. In fact, while it's clear that drinking lots of alcohol can be very harmful, there is a lot of evidence that drinking small amounts of alcohol is good for you, contributing to heart health and even boosting your creativity and staving off Alzheimer's disease. 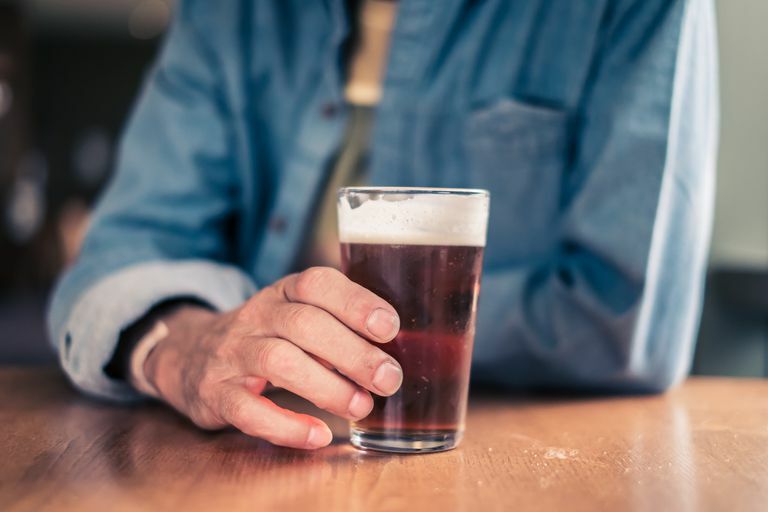 Research suggests men (and women) who consume one or two alcoholic drinks per day have a lower death rate from coronary heart disease than abstainers. The recommended safe intake for men is no more than three units of alcohol a day, or 21 units per week. Units of alcohol should not be confused with the number of drinks, as many common drinks count as more than one unit. Men should drink no more than four units of alcohol in a single day and should have at least two alcohol-free days per week. Whether your drink of choice is wine, beer, champagne or liquor, moderate consumption could have some health benefits. Research shows that drinking the amount of alcohol that is considered within the healthy range can help relieve stress, increase your HDL (good) cholesterol, lower your risk for heart disease, boost creativity and lower your risk for Alzheimer's disease and dementia. The benefits noted above are outweighed when you drink more than a couple drinks a day. In those cases, drinking alcohol can do much more harm than good. Alcohol abuse can very negatively affect your brain, heart, liver, and pancreas. Changes in mood and behavior, high blood pressure, stroke, alcoholic hepatitis, fatty liver, pancreatitis, and cancers of the mouth, esophagus, throat, liver, and breast are all possible side effects of overconsumption of alcohol. If you choose to drink, you should have no more than a couple drinks a night and no more than 21 units of alcohol per week. Living a healthy lifestyle can produce the same benefits listed above. Seek medical help if you are drinking too much and having trouble cutting back. Brien, S. E., Ronksley, P. E., Turner, B. J., Mukamal, K. J., & Ghali, W. A. (2011). Effect of alcohol consumption on biological markers associated with risk of coronary heart disease: Systematic review and meta-analysis of interventional studies. Bmj, 342(Feb22 1), D636-D636. Jarrett, N., Peatfield, R., & Glover, V. (1997). Red wine is less stress reducing than vodka; no differences in neuroendocrine challenge test. Journal of Psychopharmacology, 11(3), 283-286. National Institute of Alcohol Abuse and Alcoholism. (n.d.). Alcohol's Effects on the Body. Retrieved March 06, 2016. Recommended Safe Limits of Alcohol. (2015, August 4). Retrieved March 06, 2016 from Patient.info. Szalavitz, M., & Szalavitz, M. (2012, March 22). How Getting Tipsy May Inspire Creativity. Retrieved March 06, 2016, from healthland.time.com. Yao, J., Zhang, B., Ge, C., Peng, S., & Fang, J. (2015). Xanthohumol, a Polyphenol Chalcone Present in Hops, Activating Nrf2 Enzymes To Confer Protection against Oxidative Damage in PC12 Cells. J. Agric. Food Chem. Journal of Agricultural and Food Chemistry, 63(5), 1521-1531. What Health Issues Should Black American Men Be Concerned About?